For those busy weeknights where you crave something hearty, filling, and comforting but lack time (and let's be honest...energy), this quick and easy gluten-free ravioli dish is for you. Three Bridges Gluten-Free Cheese Ravioli is so tender, so delicious, you will never guess it's gluten-free. All it takes to prepare the ravioli is a few minutes in a pot of gently boiling water followed by another minute or two in a pan with your choice of sauce. This gluten-free ravioli is an easy base for a variety of comfort meals. 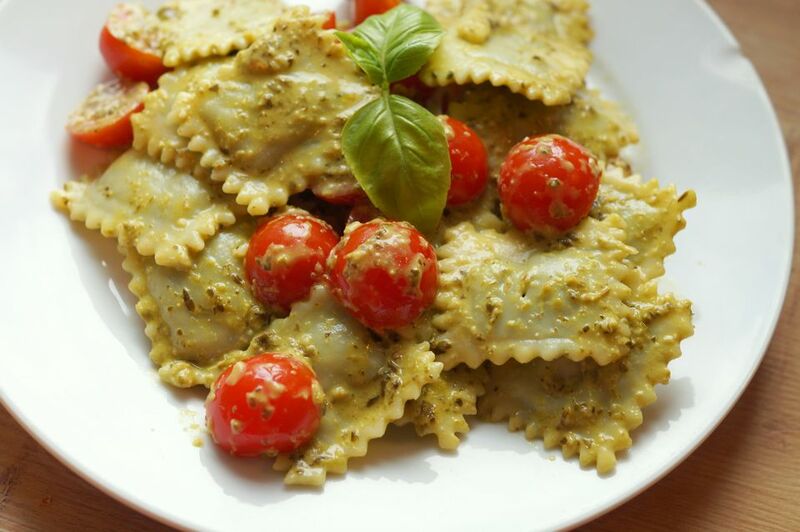 This particular ravioli dish features gluten-free cheese ravioli gently tossed in Kale Pesto along with shallots and grape tomatoes. You can either make your kale pesto from scratch in a food processor, or pick up a container of Three Bridges Kale Pesto for an even easier and quicker weeknight meal. For protein, I paired this dish with simple grilled chicken, but you can add grilled or sautéed shrimp instead or skip the meat entirely for a Meatless Monday meal. Grill boneless, skinless chicken breasts per preference - either on the grill, George Foreman type electric grill, or purchase and re-heat pre-grilled chicken strips for an even faster weeknight supper (Trader Joe's sells delicious pre-grilled chicken breasts). In a medium-sized skillet, heat 2 teaspoons of olive oil over medium-high heat. Add the shallots and cook 2-3 minutes until softened. Add the halved grape tomatoes and cook another 2-3 minutes until softened. Season to taste with salt and pepper. Add the pesto and cook another 2-3 minutes until heated through. Bring a large pot of salted water to a gentle boil. Add the gluten-free ravioli one at a time to the pot. Cook on a gentle boil for 3-4 minutes, stirring gently. Remove with a slotted spoon. Add ravioli to the pan of sauce and softened tomatoes. Gently fold the ingredients together until well combined. Divide ravioli and sauce between two plates. Add grilled chicken slices over top. Serve immediately with garnish of grated Parmesan cheese, if desired.